You probably wouldn’t be surprised to hear that my inbox is full of emails regarding recipe questions and ingredient substitutions, but the other most common question I get is about blogging. Particularly, how to get started. So, today I thought I’d take a moment to share some easy tips! Why would you want to start your own blog? Maybe you have a health coaching business and want a better way to connect with your clients (and find new ones!). Or, maybe you have exciting travels that you want to share. In that case, I’m jealous of you. Or, maybe you just want a personal website that you can share with close family and friends, to showcase your favorite food photos or baby pictures. Or, perhaps you had to move halfway across the country in one car with your husband, your dog, and any personal belongings that you could both squeeze into that car…. which means you didn’t have room for your favorite recipe collection. That’s how my own blog got started, over 5 years ago! It was an easy and clutter-free way to keep all of my favorite recipes in one place. It wasn’t until later that I started experimenting with making those recipes healthier (and, in many cases, tastier). Luckily, starting a blog is pretty easy. All you need is 15 minutes of time to compete the following steps! Step #1: Pick a domain name. First, you’ll need a name for your website. 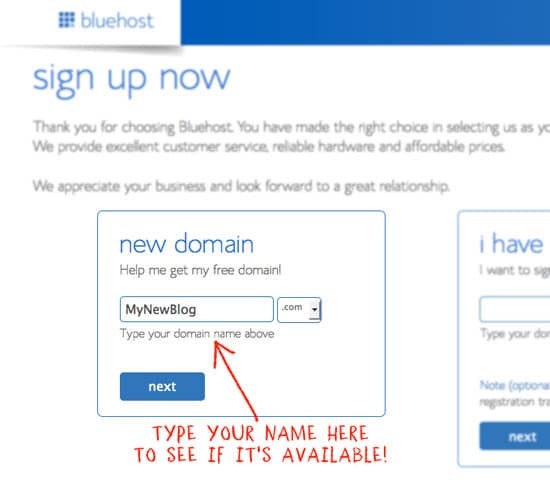 Write down several ideas, then go to BlueHost.com to see if that domain name is available. Don’t be surprised if your first few choices are taken– there are LOTS of websites out there! But, I’m sure you’ll find one that you love. Those of you who have been reading here for a while know that Detoxinista.com wasn’t actually my first domain name, but it’s WAY better than the one I had originally gone with. (My old name was based on an inside joke among a close group of friends… so it didn’t make much sense to anyone else.) You know a domain name is bad if you’re too embarrassed to say it out loud, or don’t want to share it with strangers, so be sure to pick something you like! Also, take some time to think about the topics you’ll want to blog about when picking a domain name. You want to establish your niche, but you also don’t want to paint yourself into a corner. Had I given my own domain name some more thought, I may have actually gone with a different one, since the word “detox” can be a little off-putting to some people– even if my interpretation of the word tends to be more generalized. Live and learn, right? Step #2: Choose a hosting plan. Free Hosting. If you want to blog for purely personal reasons, like sharing baby photos with your family, and you have no intention of growing your blog into something bigger, then a free blog from WordPress or Blogger may be a good option for you. These platforms include free templates to help you get your website up and running in no time, and cost you nothing– a major perk. Your domain name with one of these free sites will be something like http://mynewblog.wordpress.com, or you can pay a small upgrade fee to use a custom domain name (like the one that you chose in step one). Self-Hosted. If you want to create a more customized blog with room to grow, particularly if you ever want to run advertising on your site, you’ll need to purchase a hosting plan from a web host like BlueHost, which is recommended for WordPress sites. This type of hosting is pretty affordable, starting at just $4.95 a month, and includes a free domain name when you sign up! The self-hosted plan is what I recommend if you want to customize your blog’s look, especially if you plan on signing up for any sort of ads in the future (which can help off-set your hosting costs). Transferring a blog from a free site to a self-hosted site later can be a real pain, so it’s easier to just start with that in the first place. A $5-per-month hobby is still pretty affordable, if you ask me! 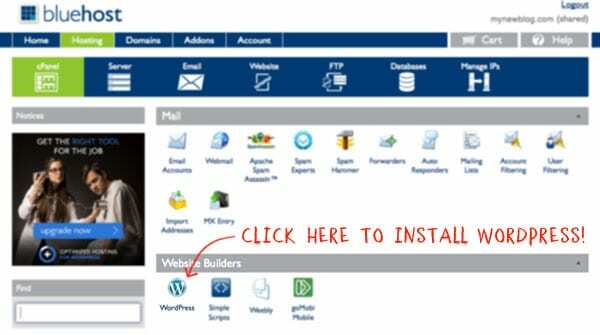 Once WordPress has been installed for you, they’ll send you a confirmation email with all the details you need to get started. *Note: If you want more direction setting up your self-hosted blog, please see my Step-By-Step Guide. Atahulapa. This is the free theme that I currently use for this website. It has a pretty easy-to-use interface, so you can customize your site to look how you want, without getting into too much code. (I know very, very little code myself… so this is key.) The con to using a free theme like this is that it can take a lot of time to get it looking exactly the way you want it to, so if you have the patience to experiment and to do a lot of Google searches to find the answers you’re looking for, this may be worth it to you. Thesis theme. If you don’t have time to experiment with a free theme, or you’ve tried that but it was too complicated for you, you may prefer to purchase a more professional theme, like the Thesis theme. For a one-time fee, you’ll get this theme along with access to their community and direct email support. Genesis Framework (with Foodie theme). Many food bloggers are starting to use this theme, and with good reason– it’s a clean design that is mobile-responsive, and it has a built-in template for recipe pages! Considering that I add my recipes individually using HTML code at the moment, this theme sounds really appealing… and I may just switch to using it very soon. That’s really all there is to it! However, there are a few “extras” that can make your blog even better, if you’re feeling up to it. A Good Camera. If you want people to find your blog or pin your content to Pinterest, good photos are a must. I don’t consider myself to be a very good photographer, but luckily my camera does a lot of the heavy lifting for me. I started this blog using a basic point-and-shoot camera, but my photos got a lot better when I upgraded to using a Sony Alpha DSLR camera. I’ve been using that camera for nearly 5 years, paired with a 50mm f/1.8 lens. (This lens makes the subject crisp while keeping the rest of the photo blurry.) I have just recently upgraded to using a 50mm f/1.4 lens, which takes even better photos, but it comes with a higher price tag, so I’m glad I started with the other lens first. Photoshop Elements. Since I’m a professional designer by day, Photoshop is already loaded on my computer, but it’s an expensive program to own if you don’t need it on a daily basis. When I was a college student, I relied on the much more affordable Photoshop Elements program for all of my designing needs, so I’m confident it will have everything you need for editing blog photos, too. You can even download a free trial first, just to make sure. Plugins. 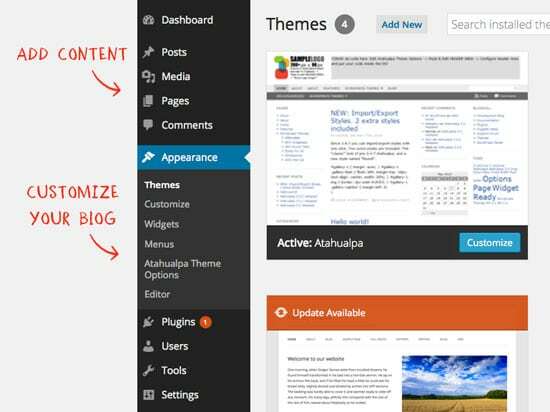 WordPress plugins can help improve your blog, by making your favorite recipes easier to print or adding a “Pin it” button to your unique content. Some of my favorite plugins include: Easy Recipe, jQuery Pin It Button for Images, and Comment Reply Notification. Once you have WordPress up and running, how much time and effort you put into blogging is completely up to you. Hopefully, the niche you’ve chosen is something that you’re really passionate about, so that blogging doesn’t end up feeling like “work.” Blogging can take up a lot of time, so make sure you love doing it for free– just like any other hobby. If you end up making some sort of income from it in the future, it’s just an added bonus! I hope that answers any questions you have about starting a blog, and feel free to share any more questions or comments below! Disclaimer: Please note that some of the links in this post are affiliate links, and I will earn a small commission if you make a purchase using them. Thanks for your support! I am following your article from last few time to create my blog. Actually, I am new in blogging so, don’t know anything more about it. Really thank you nad keep sharing. I have a blog on blogger already but i have discovered someone copying my blog posts and posting them as their own, has this happened to you? its impossible to get taken down because I have to report each stolen post and thats over 300, it will take forever. We love your blog and recipes and have been faithful followers for a few years now. I really love how you laid out your recipes page with thumbnails linked to specific posts. Can you suggest the best way to do this so it stays neatly organized? Did you use a plug in? Thank you for all of your wonderful content! I used to do the thumbnails using HTML code, but now my WordPress theme does it for me– I use Genesis + Foodie Pro, which automatically organizes recipes by category. Thank you for sharing this. I’m certain that these tips are going to be handy for my blog. 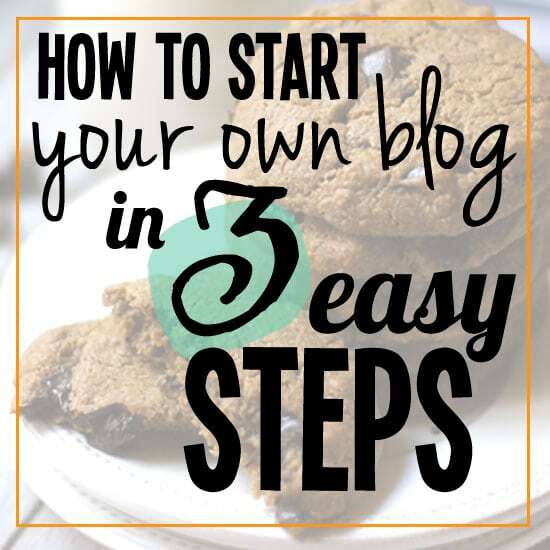 Thankyou for the useful tips, I’ve been wanting to start my own blog…this is sure gonna help me get started. THANK YOU! Also, did you need to trademark your name or any necessary things like that? Thank you for this information. That’s awesome. I love your blog & your recipes! I’ve become one of your faithful readers of late (I’ve made many of your recipes and I also purchased the Warm & Cozy Winter Detox). Your blog was one of a half dozen food blogs that I followed (and still follow) regularly that inspired me to create my own blog. I’ve seen a few recommendations for Easy Recipe but I just cannot figure out how to use it for Word Press! Any tips? I’ve downloaded the file from Easy Recipe, but I see no way to “engage” it when I am signed in Word Press. I”d appreciate any support, links or resources you can provide. Hi Lauren! Once you’ve installed Easy Recipe, it should show up as a tab in the left sidebar. It’s location will vary depending on the plugins you use, but it should be close to the bottom of that sidebar. Click on that tab to open up your settings, and then when you use it in a post, there will be a button to add the recipe format to your posts. If it’s not showing up as a tab, you probably haven’t activated the plugin yet. Thank you so much for your quick reply. After searching the WordPress support forums, I finally figured out that the problem is that I am using the wordpress.com free hosting service vs. the wordpress.org service. The former does NOT support external plugins, such as Easy Recipe. I’m so disappointed to hear this and I wish it had been more explicit when I first signed up. I’m not prepared the spend any money on what is, currently, just a hobby blog. So, for now, I’m relegated to using recipe short codes. Thanks again and I hope you’ll check me out (although maybe wait a few months until I have the glitches sorted out). Love your blog and all your recipes. Not sure I could do this, but interesting reading how it’s done. Thank you for this great info! I have been wanting to start a healthy food/personal blog for awhile now but am having trouble with understanding the whole blogging world and how to set up my blog so that it is visually attractive and has everything that I want. Is there any classes or anything that you can take to help with this?? Any advice would be great! Thanks! Oops, maybe I start with checking my spelling!!! I love to write, and I love reading what others write….especially since recently trying to get myself off of wheat, and just be healty. I SO would love to at least attempt a blog….but honestly I didn’t even know what a blog was until this year. Also wondering if maybe I’m just too old to start something like this? I’m 52. Advise? Thanks!!!! Thanks for such great tips! I think it’s awesome that you’re out there to help people do what you’re doing even if it raises the blog “competition”, ha. It shows that you genuinely love what you do and want to share it with others 🙂 You inspired me to start my own hobby blog a couple years ago (I’ve taken the last several months “off” since the first trimester of our second baby threw me off…), but I’ve been just treating it like a hobby–I, too, am grateful that I don’t have many readers at this point since I have SOOO much to learn! Maybe down the road I’ll consider a domain instead of blogger. Thanks again for the inspiration, delicious recipes, etc! BTW, I CAN’T WAIT for your cookbook….coming soon hopefully? 😉 No pressure…you are one busy lady. And even though I finished the cookbook months ago, we still have quite a while before it’s out… it’s all in my publisher’s hands now. I’ll be sure to post an update when I know more! Thanks so much for this post, Megan! Naomi, I love your site! I was curious and clicked. Your content is right up my alley! Thank you so much for sharing this info! I’m in the process of redesigning my website and this is all very helpful info. I have been on the fence on whether to buy Photoshop Elements or not. Is that how you put the cool banners with font on your photos? Yes, I use Photoshop to create everything, including editing the lighting in my food photos. Thanks for sharing. I may try this as a hobby – always sort of a fantasy but so tech challenged, it seems scary and out of my reach. May talk to my 19-yr-old daughter to see if she thinks I’m capable – LOL! Also, we love your recipes. My picky daughter even likes them, especially the macaroons, the mac and cheese and the cheesy spaghetti squash (can’t remember the name – these are all in your favorites). We’re both gluten-free, and we try to eat healthy in this house – so expensive but worth it. Love your blogs and will continue to try new recipes from your website! BTW – I found your website last August when we were doing a 21-day cleanse – sure I found you on google because of the detox in detoxinista. This is great info– thanks for taking the time to write these tips up! I am curious– can you approximate the amount of time per week you spend on your blog? You work full time (and I’m not including the baby! )– how do you manage? Your recipe posts are pretty straight forward, highlighting the ingredients and their health benefits and you keep the side stories to a minimum, so I am assuming the writing aspect of the post doesn’t take as much time as the recipe development and photography? Also, do you find food blogging to be expensive? Aside from the server fees, I am assuming buying all the ingredients can be pretty expensive. I ask because these are the two aspects that prevent me from seriously considering food blogging (that and I have ZERO photography or ingenious cooking skills!). Thanks again! The time spent blogging per week can get a bit blurry, simply because some of the “work” is stuff I’d be doing anyway– like cooking for my family. When I started blogging, I didn’t make any recipes specifically for the blog, so it didn’t feel like work… it just felt like I was making lunch! And in the same vein, it also wasn’t any more expensive, because I had to eat, regardless. So, I’d say for the first several years that I was blogging, it wasn’t too expensive. It mainly adds up when you get a recipe idea in your head, and have to attempt a recipe several times to get it just right. Luckily, most of my failures still taste good enough to eat, so I’m not wasting ingredients, but it can definitely get pricey. (Once you get to that point, though, it’s a good idea to have some ads running on your site, to help off-set the extra costs!) Camera supplies, dishes, and photo props can also get expensive, but again, we use our camera for family outings and the eclectic dishes for dinner, so everything has a function in our regular lives, too. Megan, thank you for all you do! I enjoy your site so much! I was ready to start my blogging journey with blue host. I filled out a few lines and got the domain name I wanted. However, after chatting with blue host, I decided to wait. What they don’t mention on their site is the fact that the entire amount of the chosen term is due up front. Monthly payments should be a choice. So, for now, I’m thinking of the free blog with the option to purchase my domain name. Thank you Megan for the post, I need all the tips I can get. I too wanted a place to save all my recipes. 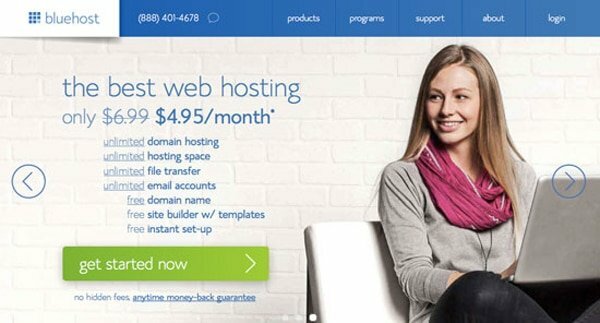 I just signed up with Bluehost, $3.95 for 3 years, I thought that was a pretty good deal. I am having fun designing but there is quite a learning curve and I do software support for a living. I have been teaching myself watching wordpress and Photoshop Youtube videos. It is a fun hobby, just slow going starting out. Great post Megan thank you! I have a food blog and it’s interesting to see how I can grow it! Thank you so much for your ideas about detoxification, though you have second guessed yourself, by your own admission. Your page is great; an easy read and to navigate and post to. Thank you for the additional input on blogging as well. Definitely doing this. I’m printing it all out first for reference. Very excited about having my own blog! Any advice? I want to see who out there beside just looking at my google analytics. I know who’s there from the numbers, but want to also know if I’m reaching my target audience. I usually have some sort of question at the bottom of my posts, to help get a conversation going, but other than that, I don’t feel like I do anything special to gain comments. Some posts just inspire more than others, which is just the nature of blogging. The more visitors you get, the more likely you’ll get more comments, too! I only use Google Analytics to monitor my traffic, so I don’t have any other advice for you there. Glad to hear you’re enjoying my recipes! I love your blog and recipes. Your Honey Dijon Dressing got me through a very though diet to clean my body from food intolerances. Do you do any paid marketing for your blog? How do you reach people? That’s one of my very favorite dressings, too! As far as reaching people, I don’t do any paid marketing. I pretty much rely on organic traffic, which either comes from Google searches or readers sharing my content on Facebook or Pinterest. I feel like a lot of it is just luck and consistency. And also persistence! I’ve been doing this as a hobby for nearly 5 years now, and my blog didn’t start to really grow until the last year or so. I missed your WIAW post! Hope you ll be back next week – always enjoy seeing your eats! Hi. Your blog is one of the ones that inspired me to start my own blog about 1-1/2 years ago. I started it for personal satisfaction, but now I’d like to take it farther. I’m hoping you can tell me how you get so many people to interact with you. I would love to see more comments, questions, emails, etc. You do such a great job — thanks for everything! For me, I think it’s just been luck and consistency. I’ve found that I need to post at least twice a week to get regular visitors, and I try to respond to comments as much as my other job and baby allow, which I think helps keep the conversation going. Other than that, I’m not sure I do anything special! From a complete techie novice I cannot thank you enough for this! Totally struggling with this. Pictures show up sideways, old template photos still show. Website throughGoDaddy, signed up with WordPress, bought WordPress for Dummies, returned WordPress for Dummies; need WordPress for Dummer Dummies, HELP! Hmm… it sounds like maybe you need to edit your photos before you upload them to WordPress– that’s the only reason I can think of that they would show up sideways. Like I mentioned above, I use Photoshop to edit my photos, but you may want to try the free trial of Photoshop Elements to see if that helps you? Be sure to select “Save for web” when you save your photos so that they will load quickly on your website. Thanks so much for making this so approachable! Great blogger advice AND great recipes. Perfect for my entry into both. How do I follow you on WordPress?